The past bloody decade in Iraq was full of men who bragged about their criminal acts. 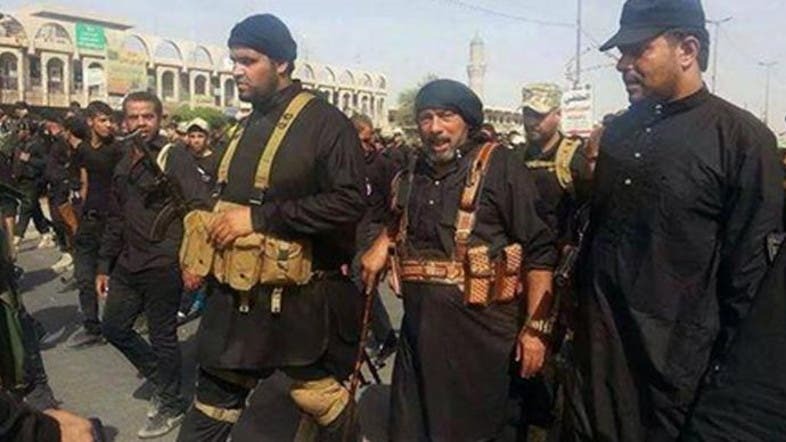 Abu Deraa was one of these braggarts and it seems he has returned to Iraq. Shiite militants have posted a video on YouTube celebrating Abu Deraa returned following years of being untraceable in Iran. In the video, he appeared talking with armed men who belong to a militia he leads in Baghdad. An officer appeared in the video, standing behind him for protection. The man, whose actual name is Ismail Hafez al-Lami, is infamous for taking delight in killing the Sunnis, according to a 2007 report by The Sunday Times. “He is said to take personal delight in killing — sometimes with a bullet to the head, sometimes by driving a drill into the skulls of his victims. On other occasions, Iraqis say, he gives them a choice of being shot or battered to death with concrete building blocks,” the report said. Abu Deraa’s militia used to kill Sunni men deemed a threat to Shiite shrines and the dumps them in a wasteland known as the “Happiness Hotel,” the Sunday Times report said. He vowed to sacrifice that camel if he succeeded in killing Tariq al-Hashimi, Iraq’s former vice-president, who is a Sunni. He is believed to have lived in Sadr city in Baghdad and had small crimes previously under his belt when his was young. But his crimes advanced as he grew older. Abu Deraa is believed to be behind the killing of Khamis al-Obeidi, Saddam Hussein’s lawyer, in 2007. A video posted on YouTube shows Obeidi being handcuffed by two men believed to be members of Abu Deraa’s militia. During his activity in the al-Mahdi army organization, linked to political leader Muqtada al-Sadr, he turned into a star but he didn't make it to the list issued by Nuri al-Maliki's government on July 2, 2006 and which included 41 terrorists. The list only included two members of the al-Mahdi army and they were Abu Mustafa al-Sheebani and Ahmad al-Gharwi. American troops which pursued Zarqawi and his followers also pursued members of the al-Mahdi army and mainly Abu Deraa in al-Sadr city but failed to arrest him. Maliki commented on the operation by condemning it but his own forces conducted a similar operation in al-Sadr city in April 2008. Abu Deraa was no longer heard of and there were news that he was assassinated in a car bomb that targeted an ambulance he used for transportation but a photo released in November 2008 showed him in Iran's Qom with other members of the al-Mahdi army. His return to Iraq now comes as Sunni fighters from the Islamic State of Iraq and Syria, who had been fighting in Syria’s civil war, gained control of many swathes of Iraqi territories since last week, including Mosul, the country’s second largest city.